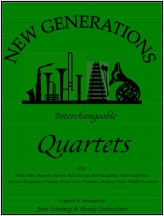 The Interchangeable Quartet Collection is attractive as a resource for introductory chamber music pieces at the High School level as well as Concert Band selections for small bands with incomplete instrumentations. Yes, any instrument may play any part. So, each of the ten selections can be played with any combination of instruments. This provides wonderful opportunities for teaching & rehearsing individual parts as well as performing with unusual instrumentations. The Full Score shows all parts in Concert Key, while each instrument book has all four parts notated separately. Click on an item for more details.